In today's edition of the Top Gear TV programme, Jeremy Clarkson folded himself up and slid behind the wheel of a Peel P50, a microcar built on the Isle of Man in the 1960s. During the programme Clarkson complained of the irony that the dimunitive Peel had to pay the dreaded congestion charge, whereas the much larger Lexus RX400h 4x4 being used as a mobile filming platform would slip inside the C-zone without incurring an £8 levy, due to its hybrid powerplant. Sadly for Mr Clarkson, he was rather wrong. At 134cm long and 99cm wide, and boasting just three wheels, the Peel does in fact qualify for exemption from Ken's road tax. As we’ve pondered before, you don’t have to pay the C-charge if your car is a tricyle less than a metre wide and less than two metres long. As we've also mentioned before, it is tough to find many cars that fit within this exemption, leaving us with a slightly bizarre conclusion. When the rule-makers at London City Hall were drafting this three-wheeler exemption - much too narrow for a Reliant Robin, BMW Isetta, Heinkel Trojan, Piaggio Ape or even a Peel Trident, and too short for a Messerschmitt KR200 - they must have had the Peel in mind. Nothing else fits. Well, apart from the slightly longer, slightly narrower, Brütsch Mopetta of 1958. 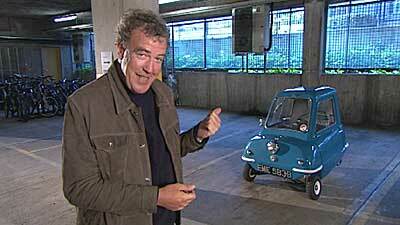 But that's less like a car and more like a patent leather shoe fitted with a 50cc motor. It's an odd one. Who would draft a law with an exemption that applies to pretty much nothing on the road except a couple of obscure oddities built half a century ago? But then anything's possible from London's Mayor - and his newts.